My ‘Anne’s Asian Adventures’ have inspired all kinds of dishes, including a take on a very traditional Luxembourgish dish: Paschtéitchen, or bouchée à la reine. 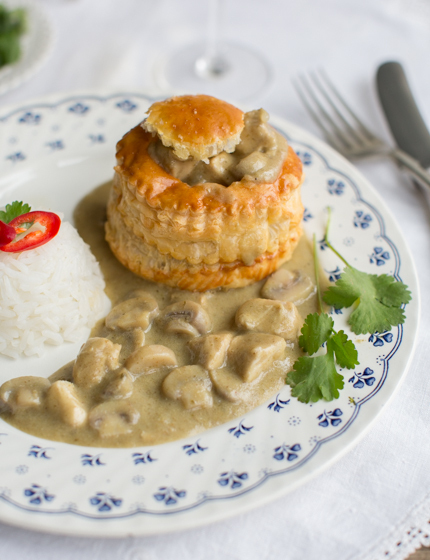 A vol-au-vent puff pastry case with a creamy chicken and mushroom filling. It is usually served with rice or chips, and it’s really one of my very favourite Luxembourgish comfort dishes. 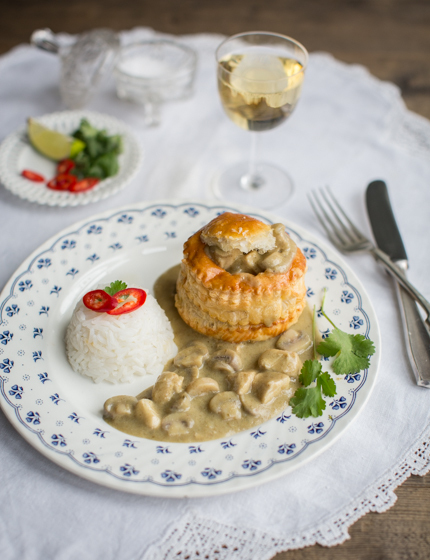 I’ve given this lovely dish a Thai twist – filling it with a creamy Thai green curry, using chicken and mushroom, just like in the original. 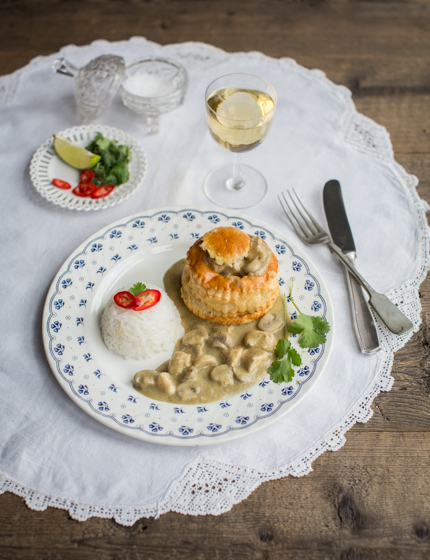 I really think it works very well – the buttery, crispy vol-au-vent pastry totally complements the fiery Thai green curry. Lots of Luxembourgers might be a bit sceptical about this crazy fusion dish, but it holds a very special place in my heart – combining a homely dish from my childhood with the flavours of my favourite travel destination in the world. I created this recipe for my collaboration with Auchan supermarket. We’ve even filmed a really cute video, which shows you how to make this recipe step-by-step, you can watch it here. Cut the chicken into bite sized chunks and set aside. Cut the mushrooms into slices and set aside. Heat the sunflower oil in a large saucepan and fry the Thai green curry paste for a minute until fragrant. Add the coconut milk and bring to the boil. Add the chicken stock and return to the boil, then add the chicken pieces. Reduce the heat and leave the curry to simmer without a lid for 20 minutes. Meanwhile, cook the rice: wash the rice in a sieve under a running tap and put into a saucepan with 550ml cold water and ½ tsp salt. Cover with a lid and bring to the boil. Cook the rice for 10 minutes without stirring until all the liquid has been absorbed. After 20 minutes, add the sliced mushrooms to the curry and cook for another 5 minutes. Put the cornstarch into a little bowl and dissolve in 8 tbsp of cold water. Add to the curry and boil the liquid for another couple of minutes, so that the curry sauce thickens. Season the curry with Thai fish sauce, sugar and a bit of lime juice to taste. Before serving, heat the vol-au-vent pastry cases in a 180°C fan oven for 5 minutes until warm. When ready to serve, fill each pastry case generously with curry. Sprinkle with coriander and serve with a portion of rice, lime wedges and chilli slices.